Gardening is good for our air, our water, wildlife and us. At Wegerzyn Gardens, we actively promote landscaping with native plants in balance with traditional garden selections. Home gardeners will find a wealth of design ideas, plant combinations and cultivation techniques suitable for the Miami Valley and kind to the environment. Kids will appreciate and interact with the wonders of nature in the Children's Discovery Garden. Venture into the woodlands on the Marie Aull Nature Trail or the Swamp Forest Boardwalk and immerse yourself in the botanical richness of the Stillwater River Corridor. Dogs are welcome, but, for the safety and comfort of all patrons, they must be leashed and under control at all times. Dogs are not permitted in the Children’s Discovery Garden. All school, commercial or nonprofit groups of 10 or more are required to schedule their park visit in advance. To schedule a visit call 937-275-PARK (7275). Both adult and youth tours are available by request. Learn more about tours. Lush in spring and summer, and ablaze with color in the fall, the Stillwater River Trail provides cyclists, runners and walkers serene and diverse terrain. Ride south to visit Triangle Park and DeWeese Parkway, home to the Boonshoft Museum of Discovery. Ride even further south to reach the picnic shelters, spraygrounds and playgrounds at Island MetroPark. Ride north to Sinclair Park, just west of Shoup Mill Road. Return to Wegerzyn for a relaxing stroll through one of the gardens. Enjoy a collection of gardens displaying Earth-friendly maintenance techniques to inspire the gardener in all of us. Home gardeners seeking a more refined landscape will find a wealth of design ideas, wonderful plants and cultivation techniques suitable for the Miami Valley at Wegerzyn’s Formal Gardens. Gain inspiration from the unique and beautiful combinations of annuals and perennials scattered throughout the grounds. Every season has something to offer! These remarkable gardens provide a place to play, relax and recharge any time of year. Designed as a child-friendly place to discover, experience and love our world through gardening, this garden contains habitat areas and whimsical themed gardens for children and their adult companions to explore together. Visitors are encouraged to come often to see the gardens grow and change. If you visit in summer, pack a swimsuit! Kids will delight in the park’s man-made safe wading creek, waterfall and cave. Learn more about the Discovery Garden. Find one of Five Rivers MetroParks’ big trees at Wegerzyn Gardens MetroPark. “Pedestal Oak” can be found along the trail between the parking lot and gate entrance. It is named “Pedestal Oak” because it appears to sit on a large base. You can access Wegerzyn Gardens MetroPark from 1301 E. Siebenthaler Avenue or from the Stillwater River Bikeway. Named after the godmother of the environmental movement in southwestern Ohio and namesake of Aullwood Garden MetroPark, this gentle 1-mile trail affords visitors a chance to enjoy nature in the wild. It is adorned by a stunning variety of trees and wildflowers, and provides many opportunities for spotting native birds and wildlife. This fascinating area provides visitors a rare opportunity to view and experience a vernal pool habitat. The Swamp Forest is home to Fairy Shrimp, which can only be found in vernal pools. With the encroachment of agricultural, industrial and residential expansion, these natural habitats are severely threatened. Hundreds of large garden plots are available on an annual basis at Wegerzyn Gardens MetroPark. These 800-square-foot plots are open from April-November each year for growing produce to feed you and your family. Wegerzyn Gardens also has organic plots available year-round. The parking lot has curb cuts and ramps to the sidewalks. 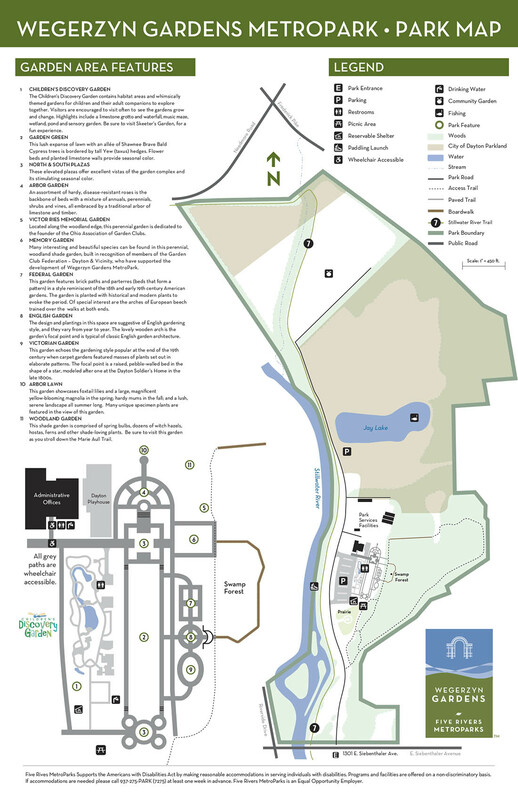 All pathways in the Formal Gardens and the Children’s Discovery Garden are handicapped accessible. There is an elevator within the Wegerzyn Center. Restrooms inside are ADA accessible. Drinking fountains are located in the Children’s Discovery Garden and are available when during the Garden’s hours of operation. Visitors will find a wealth of information presented and many places to sit and enjoy the beauty, as well as educational and inspiring programming for both children and adults. An interpretive “Tree Trail” is available along the 1-mile Marie Aull Trail, educating visitors about the amazing contributions trees make to our lives. Take Route 16 northbound on Main Street through downtown to travel to Riverside Drive and Siebenthaler Avenue. Continue on foot across the bridge 1 block to the park. The park is accessible by foot or bicycle on the Stillwater River Trail. A portable restroom is provided at the south end of the parking lot. There is also an ADA accessible restroom in the Children’s Discovery Garden, available during normal garden hours. Increase your gardening skills and knowledge of natural history by participating in a wide variety of programs offered year-round for all ages. Check the programs and events finder for upcoming programs and events. Wegerzyn includes an outstanding example of a swamp forest community, mature woodlands along the Stillwater River, the rich aquatic life of the Stillwater River and two planted prairies. The conservation staff at MetroParks works diligently to preserve the existing woodland through the control of honeysuckle and other invasive species that choke off and kills native plants. The Stillwater River Corridor is maintained in a natural state and managed for invasives. The recent project to remove honeysuckle from 58 acres of this corridor and replace the honeysuckle with Ohio shrubs and trees — burr oaks, sycamores and spice bush — should provide a friendlier habitat for wildlife and improve water quality. Surrounded by neighborhoods, lands must be protected from encroachment, misuse and overuse. The central segment of the Stillwater River Recreation Trail passes through Wegerzyn Gardens MetroPark and travels north to Shoup Mill Road and Riverside Drive. To the south of Wegerzyn, at Island MetroPark, this trail connects with the Great Miami River Recreation Trail. Cyclists, runners and skaters can easily access Wegerzyn Gardens MetroPark from the recreation trail, or can begin their journey on the recreation trail from the Wegerzyn Gardens MetroPark parking lot. The Arbor Garden blends roses and perennials, offering a peaceful place to stroll. Arched beech trees and hop hornbeams lead the way through formal gardens — the Federal, English and Victorian — filled with a riot of color to capture the eye. Dazzling in late winter are the blooms of witch hazel, hellebores and winter aconites, followed by bursts of spring bulbs, buds and new leaves. That park is home to a couple of the district’s largest trees. The “Pedestal Oak” with a whopping 201-inch circumference can be found along the loop trail between the parking lot and gate entrance. Another burr oak, dubbed “Aaron Burr,” stands nearby at 110 feet tall. Water striders can explore wet woods along the boardwalk. Visit the wet woods boardwalk and try to find little insects that seem to defy science by gliding on top of the water. The Stillwater River is home to beavers and otters along with our state’s largest population of river redhorse, a fish sensitive to pollution that has become rare in Ohio. Swallowtail butterflies feast on flowering asters along the river’s edge. Three-hundred large community garden plots are available on an annual basis at Wegerzyn Gardens. These 800-square-foot plots are available for growing produce to feed you and your family from April-November each year. Organic plots and organic year-round plots are also available. This lush expanse of lawn, with an allée of “Shawnee Brave” bald cypress, is bordered by tall yew (Taxus) hedges. Flower beds and planted limestone walls provide seasonal color. These elevated plazas offer excellent vistas of the garden complex and its stimulating seasonal colors. An assortment of hardy, disease-resistant roses is the backbone of this bed with a mixture of annuals, perennials, shrubs and vines, all embraced by a traditional arbor of limestone and timber. Located along the woodland edge, this perennial garden is dedicated to the founder of the Ohio Association of Garden Clubs. Approximately 300 garden plots are available at Wegerzyn Gardens MetroPark. Each 800-square-foot plot is $20 annually. View more information. Many interesting and beautiful species can be found in this perennial, woodland shade garden, built in recognition of members of the Garden Club Federation – Dayton & Vicinity who have supported the development of the Wegerzyn Gardens MetroPark. This garden features brick paths and parterres (beds that form a pattern) in a style reminiscent of the late 18th and early 19th century American gardens. The garden is planted with historical and modern plants to evoke the period. Of special interest are the arches of European beech trained over the walks at both ends. The design and plantings in this space are evocative of the English gardening style. The lovely wooden arch is the garden’s focal point and is typical of classic English garden architecture. This garden echoes the gardening style popular at the end of the 19th century, when carpet bedding featured masses of plants set out in elaborate patterns. The focal point is a raised, pebble-walled bed in the shape of a star, modeled after one at the Dayton Soldier’s Home in the late 1800s. This area behind the Arbor Garden is a quiet area bordered in beds mounded to give privacy and a place to relax and reflect upon the wonderful gifts that nature has given us. This shade garden comprises spring bulbs, dozens of witch hazels, hostas, ferns and other shade-loving plants. Be sure to visit this garden as you stroll down the Marie Aull Trail. The park was made possible by a generous donation from Benjamin Wegerzyn to the city of Dayton. His vision for a place of public enjoyment was realized in 1973 when the horticultural facility opened, becoming a part of Five Rivers MetroParks in 1993. Discover the Marie Aull Nature Trail, which runs approximately one mile through the Swamp Forest and natural area beyond the gardens. It’s a great place to stretch your legs while enjoying nature. In the spring, look for native woodland wildflowers blooming along the trail. The trail may be muddy or impassable during wet periods. Note: This trail is prone to mosquitoes; take appropriate precautions to prevent bites. In addition to its developed horticultural facilities, Wegerzyn Gardens MetroPark contains an outstanding example of a swamp forest community, mature woodlands along the Stillwater River, rich aquatic life in the Stillwater River and two planted prairies. The Marie Aull Nature Trail is adorned by a stunning variety of trees and wildflowers, and provides many opportunities for spotting native birds and wildlife. The Children’s Discovery Garden is designed as a child-friendly place to discover, experience and love our world through gardening. This garden contains habitat areas and whimsical themed gardens for children and their adult companions to explore together. Visitors are encouraged to visit often to see the gardens grow and change. Highlights include a limestone grotto and waterfall, music maze, wetland, pond and sensory garden. Visit two gardens in one day! In spring when waters are higher, put in at Aullwood Garden and take out at Wegerzyn Gardens for a 5-mile long section of the beautiful Stillwater River. There are two spots on this journey that commonly require a short portage. Year-round, you can also put in at Wegerzyn for a short paddle of the river down to Island MetroPark near the confluence with the Great Miami River. There’s always something in bloom somewhere in the gardens. As some plants and flowers wane, others come into bloom and color. Gardens provide ideal spaces for capturing the beauty of plants and native wildlife through the camera’s eye. You might even get some garden ideas for your own yard! Commercial photography permits are required. Art and nature are often intertwined. Visit and check out a living arborvitae circle sculpture. You can find this small collection of conifers in the middle of a prairie located just before the parking lot. Reserve the Skeeter’s Shelter for your exclusive use using our online reservation system. Unreserved shelters are available on a first-come, first-served basis. Picnic table sites are also available just outside the Children’s Discovery Garden. This horticultural facility uses compost to build better soil and nourish plants. Compost contains a full spectrum of essential plant nutrients. Visitors to the garden get to see the benefits of the compost in the healthy and beautiful plant life, as well as a demonstration of how compost is made in the Children’s Discovery Garden. To get started composting on your own, take our free Compost Kitchen program, offered quarterly, in which you’ll learn about soil science, practical aspects of making compost and how to use it to create a sustainable growing system. Did you know that on average, well-designed landscaping saves enough energy to pay for itself in fewer than eight years? Choosing the right landscaping for your climate will lower maintenance costs, cut your heating and cooling bill, protect your home from cold wind and hot sun, lower noise and air pollution and reduce your water use. Low water use gardens can be viewed at Wegerzyn Gardens. Volunteers play a pivotal role at Wegerzyn Gardens MetroPark. Volunteers assist with youth and adult programs, special events, garden maintenance and greeting guests. They also work in the Wegerzyn Gardens Foundation Gift and Garden Shop at the 2nd Street Market. Garden paths and trails at Wegerzyn Gardens are open year-round but are not plowed. Situated along the Stillwater River, this 88-acre gem of the Dayton area offers beautiful formal gardens, a children’s garden and woodland walks.